PetSittingOlogy founder Josh Cary interviews the #PSO2018 conference keynote speaker; beloved veterinarian and renowned television pet authority, Dr. Marty Becker. In this session, Josh and Dr. Becker go through the benefits and opportunities offered through Dr. Becker’s Fear Free program and how it can pet sitters in their business as well as pet welfare in general. Whether you are looking to take your professional pet business to the next level… Or you desperately want to stop competing on price… This episode will hand you specific ways you can begin to differentiate yourself TODAY from all others so you can find yourself in more demand. Grab a notebook and prepare to take notes. The ideas flow quickly! 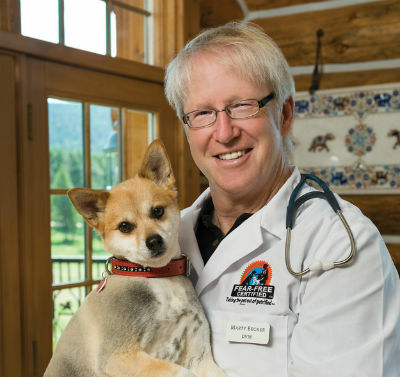 Known as America’s veterinarian, Dr. Marty Becker is the author of twenty-five books and founder of Fear Free, the movement to improve both the mental and physical welfare of pets. Author, veterinarian, and television show personality best known for his regular appearances on Good Morning America and the Dr. Oz Show, Dr. Becker became a respected authority on how to best help your pet become both healthy and happy. Now Dr. Becker focuses on his revolutionary program, Fear Free, to help pet professionals improve the relationship between pets, their environment, and creating positive experiences for a happier and healthier life. “The people [pet professionals] listening to this are such an integral part of the pet movement that we can’t do it without you” – Dr. Becker speaks about how demand for educated pet professional pet will explode within the next few years, as seen by the great demand for veterinarians. While veterinarian programs and jobs were very exclusive in the past, Dr. Becker has seen falling interest for people to go into the career along with rising rates of need for veterinarians. He feels this indicates that the demand for pet services is skyrocketing, and will soon be the next up-and-coming profession in the U.S.
“Fear is the worst thing a social species can experience, and it causes permanent damage to the brain.” – When referencing the importance of the Fear Free movement and how it can benefit pets, Dr. Becker speaks in favor of increasing the importance of emotional care in pet professionals while taking care of their physical needs. Novel experiences, when paired with physical pain, will cause future emotional distress that affects them for life. Fear Free is a program aimed at changing this process with the education of all professions involved in pet care. “We’ve gone from no interest in the emotional well-being of dogs and cats…to putting the emotional well-being of animals in bubble wrap.” – When speaking about the rapid expansion of the Fear Free movement and training sessions to include all circles of people who love pets, Dr. Becker notes how the emotional welfare of pets is finally getting official recognition. Pets will soon be able to have a system of veterinarians, trainers, pet sitters, rescue personnel and pet parents who have all learned the methods behind Fear Free. Dr. Becker hopes that this network will continue to expand to provide emotional support and knowledgeable experts in the pet care field. “I can see you [pet sitters] going in and doing diagnostics in the home.” – When thinking of the future role of pet sitters, another service Dr. Becker sees pet professionals offering is visiting a client’s home and providing suggestions on how to make a home more pet-friendly. Small items could be identified for owners such as getting rid of scented candles, the lack of climbing surfaces for cats, and getting appropriate walking surfaces for elderly dogs, all of which would create a better experience for pets. Identifying these factors and providing solutions, along with proper medication management, is a potential area of growth for pet professionals in the future and a way to set professionals on a different level. Josh lists different methods of including this new program and its tools into your business in a way that grows both your community and your business in a positive way. “This is an excellent way to make you the go-to professional in your area” – In a discussion about maintaining a unique commodity among a community of professionals mostly offering the same services, Josh questions how pet professionals can differentiate themselves from others in the business. Dr. Becker believes that it is up to pet professionals to start up a community to communicate needs and services that might benefit others. An excellent way to do this is to educate your community on ways to improve interactions between pet and people, putting yourself out there to get your professional name in the community. “Being knowledgeable about pets for your client will set you apart.” – Josh speculates about how pets all have different needs at different stages of life, which the pet owner may not be aware of. Dr. Becker agrees that pets may need different recommendations to stay healthy for all different ages and all different breeds. Pet sitters suggesting things as simple as trimming hair on elderly pets to help them stay hygienic is a simple way to use knowledge to provide extra services for your clients. “What, in general, can pet sitters do to help pets suffering from separation anxiety?” – Stemming from a question from a viewer, Dr. Becker talks about all the different causes possible for anxiety in pets. From poor early socialization, to the environment in past homes, to just a general chemical or behavioral issue, separation anxiety is rarely from a single source. Excellent methods of dealing with separation anxiety stem from positive-feedback behavioral modification, medication, diet changes, and even pressure therapy. Most of all, pet sitters must bring clients into the solution to help change a pet’s behavior and to seek professional help if nothing else resolves the issue. “What can we expect from you as our keynote speaker for the #PSO2018 conference in Las Vegas?” – First, it’s important (and exciting) to acknowledge that Dr. Becker’s role at the conference will be more of an open dialogue between he and the attendees. It will be an incredible time to brainstorm together and will feel like a mastermind! The people who come to this conference will also get to hear the dreams and thoughts Dr. Becker has for the future of the entire pet care profession. This conference will focus on environmental enrichment, working with veterinary hospitals and clients to form a close bond to help pets lead happier lives. Attendees of the conference will come away with more information on how to allow pets to lead full and rich lives as well as how to earn a livable wage by working towards a multi-dimensional support network. “People follow emotion whether it’s positive or negative.” – Josh and Dr. Becker talk about how important it is not just to like pets but to also like people as a way to create change in the industry. Through home diagnostics, interpersonal relationships, and creating networks between professionals, those going to the conference will learn how they can grow their business. Building your personal relationships is a good way to improve value for your industry. Dr. Becker is most looking forward to creating bridges with the future of the pet industry; the pet sitters and walkers. client.” – Being knowledgeable, developing relationships with other professionals, and offering a consultation with clients that offers value from the first moment will be what makes your business succeed. Dr. Marty Becker will offer ways to do all of this with the client, from continuing education efforts, ways to develop relationships with vets, how to connect with clients and pets, and ways to offer diagnostics for the home to set your business apart. Dr. Becker even speculates to a future where pet professionals will have office space with veterinarians to create a whole-pet approach. “The bar for our profession, for better or worse, is very low.” – Josh talks about how it is so easy to become a pet sitter now, that it becomes difficult to qualify yourself above all the others who are less passionate about providing quality care. Enrolling in the Fear Free program in order to add an edge to your qualifications, and by offering a service no one else is offering, raises the bar when these professional services become the norm. As the Fear Free program is in its infancy for pet sitters, people who enroll in this program will find themselves on the cutting edge of professional development in the industry. Buy Dr. Marty Becker’s fantastic new book; From Fearful to Fear Free, on Amazon. To check out his fantastic Fear Free movement, please visit Dr. Becker’s website for more information. For those looking for more information (or to sign up!) for the exciting learning opportunity at our 7th Annual PetSittingOlogy Conference in beautiful Las Vegas, please see our website for more information! I’m blown away! Novel ideas about how to enrich the lives of our pets. Exciting information every pet professional should know!